When I was in my twenties, my friend Ken and I would sometimes talk about the wisdom of living in a shared community when we were older. While it was fine for us to live with our mates in our own homes now, we thought that later, when we were seniors, a different arrangement might work better. We envisioned that a group of us could buy land together, build small cottages for each couple and also have a communal living space where meals were prepared and eaten and where we could find companionship with old friends. Medical and maintenance expenses could be shared. It would be the best of all worlds: privacy plus community, independence plus assistance. Now that I’m a senior – which I have a really hard time believing – I still think that communal model has merits, but I realize I’m no longer the one to make it happen. My friend Ken, who was widowed 12 years ago, recently sold his long-time home and is looking for another place to live with a lovely woman he’s been seeing. He’s been looking at planned communities, so I guess our long-ago dreams aren’t so far from his mind. My husband and I have spent some gut wrenching conversations thinking about our future too. We now have our own home that requires a fair amount of upkeep. The house was built somewhere around 1890 and something always needs fixing. 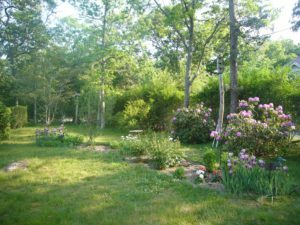 Over the years we’ve planted elaborate gardens that we’ve lovingly tended, but I know that the time will come when turning over the soil, planting, watering, fertilizing and weeding will not be doable for arthritic hands and knees or aching backs. We already have someone else cut the grass in the summer, pick up the leaves in the fall and plow when the snowstorms hit. We are part of the baby boom generation that has a hard time accepting we won’t be young forever. And, therefore, trying to have a conversation about what we should do when the time comes for us to not do what we’ve been doing for so long is really hard. We still feel good and don’t really want to dwell on the tougher times that could be ahead when we may have to move from our cherished home. A relative recently told me he planned to put a deposit down on an assisted living place. For $1000 he reasoned, he could get on the waiting list. If he got called and didn’t want it, he could refuse and put his name back on the list. “It’s an insurance policy,” he said, adding that he hoped he never had to use it. I like that idea. At least it’s a plan and makes me feel as if I’m not being irresponsible by not doing anything about the future. Although I must admit, the plan that Ken and I tossed around so many years ago appeals to me more. It would have enabled us to be with our friends in our old, old age and not strangers. Of course, that’s only if the friends I’d want to live with were still around. Something you just can’t count on.